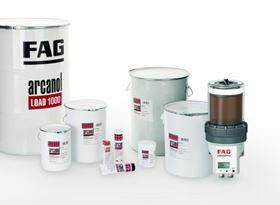 FAG CONCEPT2 is a compact, cost effective lubrication system for rolling bearings that ensures a constant, optimum supply of grease to the bearings without the need for manual intervention, particularly if machines are located in difficult-to-access areas or are deemed as critical to the production process. The system is suitable for both OEM applications and retrofitting to existing machines or equipment. The system provides two lubrication points, which are controlled by either one or two individual piston-dispensing pumps, enabling the system to be adjusted to meet up to two different bearing sizes with varying lubrication requirements. Rather than having to purchase two separate single point lubricators to cope with different bearing lubrication requirements, users can now buy one FAG CONCEPT2. The system is suitable for dispensing lubricant to a variety of industrial rolling bearing applications, including pumps, fans, compressors, gearboxes and electric motors. FAG CONCEPT2 operates on Schaeffler’s ARCANOL range of lubricants. This range includes a large choice of greases developed by Schaeffler application engineers and produced by leading international lubricant manufacturers. These greases provide specific lubrication properties for almost every type of industrial application. New 3DSO Plunger Arrival Sensor for plunger lift wells.